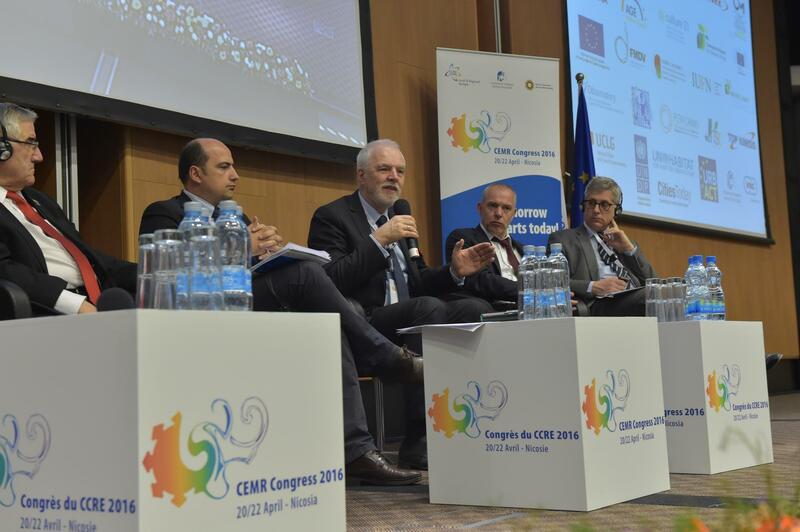 The Executive Director of NALAS, Kelmend Zajazi, took part at the Congress of the Council of European Municipalities and Regions (CEMR) in Nikosia and participated in the closing plenary. Calls to rethink the European project dominated the plenary, with participants in the panel debate suggesting that a new practice of local and European policy will re-invigorate a desire for Europe that “has dried up”. Mr. Zajazi reminded that in the time of crisis following the break-up of the Soviet Union, “the attitude of states was to close and centralise”. Despite the fact that in South East Europe most challenges are magnified, with a decline in quality of governance, and a deterioration in public trust, “citizens have not lost hope” and “a federal union can save Europe”. On their part, the Mayor of Fontainebleau and Coordinator of Debating Europe 2030 Frédéric Valletoux called “for a new practice of local and European policy”, while the President of the Congress of Local and Regional Authorities of the Council of Europe, Jean-Claude Frécon, “called for a renewal of politics, a renewal of public life actors and a renewal of hope”. The Member of the European Parliament, Jan Olbrycht called on mayors to take part in the future of Europe, but pointed out that the reality of Europe may be completely different in a few months, should the referendum yield a Brexit vote. While recognising that proximity to citizens entails more responsibility for local governments, there was also a frank assessment that there are many mayors and citizens that are becoming increasingly anti-European, but he suggested that “local government has to rethink Europe because all the decisions taken at EU level are implemented at the local level”. At the end of an intensive three-day conversation, the debate panelists discussed challenges that are not unique to Europe, but which transcend continents and borders. The Mayor of Johannesburg, Mpho Parks Tau, suggested that “government is not something that is static… it needs to adapt to changing conditions, and we must never say that we have mastered the art of governance”. He went on to point out that “local authorities must go beyond [geopolitics], and build on the capacity of their members” to find solutions to common problems.